Another tuber (edible root). Kumera is a marvellously versatile vegetable that originated in the West Indies. Like potatoes, it can be cooked in many ways and has the added advantage of being packed with antioxidants with a lower GI than potatoes or pumpkin. It has a pleasant, sweet taste and when mashed is delightfully smooth. Great for kids. Most are orange in colour but you can buy white and purple varieties. Buy fresh, medium-sized roots. Look for smooth skins and no mould on the ends or excessive dryness. Store in a cool pantry for up to 10 days. 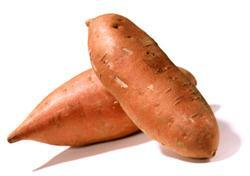 For improved health and weight maintenance, substitute pumpkin and potato with kumera. A serve of kumera is equal to half a cup of chopped vegetable. Sweet potato chips are great for the kids - cut very fine slices and brush with olive oil. Lay them flat on baking paper and bake for 10 minutes before turning over and repeating the process on the other side.